After Carlo Ancelotti got fired, Jupp Heynckes took charge at Bayern Munich now for the fourth time. Against Freiburg Jupp Heynckes returned to Allianz Arena for the first time after the treble 2013. With the international break last wing Heynckes had only a few training sessions with the whole squad, so you could not expect that many changes. As Heynckes said at the press conference he prefers a back four and Javi Martinez will play in midfield like 2013. The biggest difference compared to 2013 was that Bayern played in a clear 4-1-4-1 with the ball as well as in defense. In Goal played Sven Ulreich. Boateng, Hummels, Alaba and Kimmich got lined-up as the back-four. Martinez was in charge of the space in front of the back four while Thiago pushed higher and played alongside Müller in the middle. On the left-wing Kingsley Coman supported Alaba while Robben was the right winger. Robert Lewandowski was the lonely striker up-front. Freiburg played in a 5-3-2 when Bayern had possession. Alexander Schwolow was the goalkeeper. Schuster played as a central defender of the back-three/five. Lienhardt on the right side and Söyüncü on the left were the other two defenders. Christian Günter and Pascal Stenzel defended the wings. When Bayern had the ball, they dropped back to create a five-man line at the back. In midfield played Höfler in the central position and got support from Haberer and Mike Frantz. Kent played as a deep-lying forward while Florian Niederlechner was the central striker in Christian Streich’s system. The first changes made by Jupp Heynckes got obvious when Bayern built-up the game from behind. The centre backs pushed wider and consequently the full backs positioned themselves higher up the pitch with a connection to the centre backs. Under Ancelotti the centre backs normally played closer together. However, the wider approach helps the centre backs to pass the ball into the midfield. The angles are different because the centre-backs have more diagonal passing options. Especially when the opponent presses with two strikers, it is easier to bypass the first line of pressure from a more wider position. Martinez gave the centre backs a passing option between the strikers of Freiburg. With Martinez Bayern created a triangle and therefore outnumbered Freiburg with a 3vs2 in the build-up. Compared to Ancelotti the centre backs have the responsibility for the build-up which seems logical because Boateng and Hummels are at the highest level of Ball playing defenders in the world. The fullbacks normally positioned themselves on the same line as Javi Martinez which gave Bayern a comfortable structure to build-up from behind. In addition to Martinez, Thiago could sometimes come deeper and support the build-up. If Thiago dropped deeper Coman could push inside. Therefore, Thiago had a lot of space in the first half because Freiburgs midfielders couldn´t follow him without getting outnumbered in the ten-space. As I mentioned above Coman regularly pushed in the middle and offered a passing option between the lines which makes him harder to defend for Freiburg. Together with Müller and Lewandowski or Thiago Freiburgs midfielder had to defend those three while pressing higher up the pitch to deny the forward pass for Martinez. Especially in the first 20 minutes, Freiburg struggled a lot with defending players into different fields of vision. Robben occupied the right halfspace or the right wing. Depending on the position of Kimmich who sometimes positioned himself in the halfspace to connect the team if the ball was on the other side. The inverted role of Kimmich was observable in the offensive game of Bayern too. When the ball was on the left wing or in the left halfspace, Kimmich did not stay wide but rather pushed in the right halfspace. The inverted role of Kimmich matched with Arjen Robbens natural behaviour. Robben likes to stay wider and cut inside with the ball. With the role allocation, Heynckes used the strengths of both players better than Ancelotti. Kimmich connected the right with the left wing. For instance, Thiago could switch sides with an easy pass to Kimmich in the right halfspace. If Kimmich received the ball he passed it on to Robben and created overloads with Robben to cross to ball into the middle. Furthermore, Bayern tried to overload certain areas on the pitch. For example, when Bayern had the ball on the right-side Robben and Kimmich got supported by Müller. Martienz shifted on that side too. He was an additionally passing option and the protection. If they lose the ball Martinez was able to slow down the counter and gave his teammates time to recover. Other than that, Bayern’s offensive game looked faster. They moved the ball more, because of the improved structure they could force Freiburg to relocate their defence constantly. But Bayern lacked on the precision and the right supporting movement to break down Freiburg’s defensive block consistently. Many attacks result in crosses from one of the wings or Bayern tried to chip the Ball in the box. The first goal was a good example of a path from deep which get the defense out of position. Alaba cut inside and got the ball from Coman. In the end, he found Müller and Schuster who committed an own goal. Despite the chance creation with controlled build-up, Bayern tried to play fast vertically. Boateng and Thiago played a long ball behind the last defensive line of Freiburg a couple of times, however, the timing of the movements and the precision of the passes were rarely on point. In the first half, Bayern was really dangerous if they won back the ball quickly. Due to Bayerns improved structure, their counter-pressing worked better. Freiburg rarely could start a counter out of their own half after Bayern lost the ball on offence. This was not the case under Carlo Ancelotti. With the Italian as a coach Bayern was not that connected to each other furthermore, they lacked the real protection of their offensive players which by the way rarely participated with full energy in counter-pressing scenes. Quite often you could notice large unoccupied spaces in midfield while Ancelotti was in charge of the team. Jupp Heynckes changed not only the mentality of the team, with Martinez who protected the spaces behind the offensive players and Thiagos role as a supportive midfielder, Bayern had two players in the centre against Freiburg who could start recovering the ball immediately after a cross got defended or a winger lost the ball. Kimmich’s role as part-time inverted fullback helped to gain superiority in the middle of the pitch. The better structure after losing the ball was particularly noticeable after crosses in the box when Bayern quickly regain the ball which Freiburgs defenders cleared away. Everybody who followed Bayern over the last weeks saw their tremendous defensive issues. Under Ancelotti Bayern looked uncompact. Not only the defending in the own third also the pressing. The distances between the parts of the team were too big. In Heynckes first game those issues mostly disappeared. Bayern’s high aggressive pressing looked compact, the players were able to tighten the space for Freiburg. Consequently, Bayern could hold Freiburg in their half over almost the whole twenty minutes at the beginning. Heynckes adjust his pressing to Freiburgs build-up with five players at the back. Robben and Coman attacked the centre backs and tried to cut the passing options to the wing. Lewandowskis task was to pressure the central defender while trying to hold the central midfielder of Freiburg in his cover shadow. Bayern’s full backs pressed Freiburgs wingers while Müller and Thiago closed the centre. Near the ball with clear marking of certain players. Martinez marked Haberer who pushed higher or covered the space behind Müller and Thiago. After twenty minutes Heynckes side settled deeper and played in a clear 4-1-4-1 midfield pressing. In this midfield pressing the wingers, Thiago and Müller positioned themselves on the same horizontal line and especially tried to deny Freiburg any space on the ball near side. This was important because of the formation Bayern had a natural disadvantage. Freiburg constantly occupied the ten-space with three players so when a pass came through Martinez got problems and the center backs had to move out of the back four which provides space behind the lines which Freiburg rarely could use because Boateng and Hummels won almost all duels in that area. 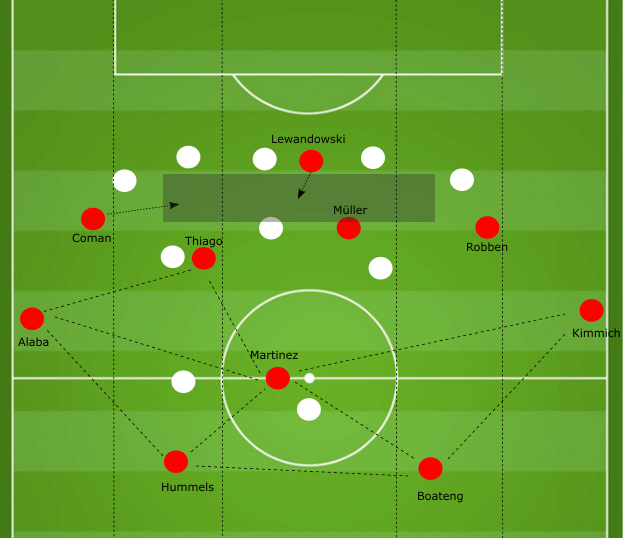 Especially over the time, Bayern played that midfield-pressing, the importance of Martinez as a central midfielder in front of the back four got obvious. With his physical abilities and his intelligence, Martinez controlled the whole space and timed his tackles perfectly which helped Bayern to stay compact. Freiburg rarely had the ball consistently. As I mentioned above, because of Bayern’s aggressive pressing in the first twenty minutes, Freiburg could rarely build-up from behind. Too often their build-up resulted in a long ball which Bayern could easily intercept. Or even worse Freiburg lost the ball in their own half, which Bayern gave opportunities to attack immediately the open space. After the intense beginning, Freiburg had more time on the ball. They tried to build-up with their back-three while the wingers positioned wider. Höfler played as a central midfielder and offered a passing option for the central defenders. He got supported by Mike Frantz who settled deeper compared to his pendant Janik Haberer who pushed in the ten-space. Between the lines, Haberer supported Kent and Niederlechner. Freiburg rarely used the wings, they preferred to stay connected in possession. Freiburg focused more on pressing Bayern higher up the pitch and win the ball back, preferable in Bayern’s half. Freiburg triggered the pressing in a certain way. For example, if Bayern moves the ball in their back four, Freiburg pressed with two strikers more passively. Focusing on cut down passing lines to Martinez and isolating of Bayern players. 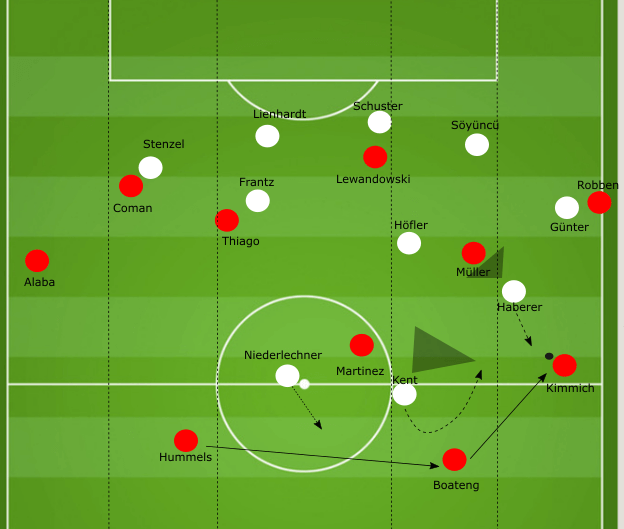 If they were able to provoke a pass to a centre back who then had only a few passing options, Haberer or Frantz could push forward and press aggressively, consequently, the whole team moved higher up the pitch and tried to close down Bayern. In midfield, Freiburg often used mannorientations against Bayern’s midfielders. For instance, Haberer followed Martinez quite often. With their 5-3-2 pressing, Freiburg closed the middle quite good. Bayern’s structure denied a fluid build-up during phases in which Freiburg pressed aggressively. Sometimes Bayern’s central midfielders Müller and Thiago positioned too high and Bayern had to play the ball to the wing. In other situations, Thiago solved those scenes. The best chances were created by a successful high pressing with mistakes of Bayern’s players. Furthermore, Freiburg pressed very flexibly, either the central midfielder or the winger could press Bayern if they played the ball to the wing while he got supported from the rest of Freiburgs team. Both chances in the first half resulted from mistakes Kimmich and Müller made when they got pressed on the right wing. In the second half nothing changed, Bayern controlled the game and could create some chances to score more goals. They scored their second and third goal in a phase in which Freiburg was the more active team, after the third goal the game almost ended, but Bayern did not stop playing and scored two goals more. From a tactical point of view, you could be satisfied with the development of Bayern. Heynckes changed the mentality of the team, worked to fix the defensive issues and Bayern looked better structured and compact with and without the ball. Their 4-1-4-1 pressing in Freiburg’s third was quite good, if they improved the pressing further on, this could get one of Bayern’s strengths which could affect their game in the Champions League against stronger teams positively. The offence game will need some time to improve but the game against Freiburg was a beginning. Heynckes showed his great knowledge, the adjust his teams pressing to Freiburgs three at the back as well as the roles of his own players. It will be interesting to see how Heynckes will change the game of Bayern Munich and how successful they can be this season. Don of a new Aberdeen?